Bold, adventurous programming from ETO in their autumn tour this year saw two relative rareties on the operatic stage, The Lighthouse by Peter Maxwell Davies and The Emperor of Atlantis by Viktor Ullmann, coupled with a relatively safe and crowd-pleasing Albert Herring by Britten, whose operas are set to flood the world’s stages in 2013, his birth centenary year. I heard good reports both of the Albert Herring and, particularly of The Lighthouse, which was evidently a revelation to some of the Snape Maltings audience, but I was especially interested in seeing The Emperor of Atlantis, a work that has enjoyed an increasing ‘buzz’ among musicians in recent years, and which looks set to be staged with greater frequency in years to come. And in James Conway’s haunting, atmospheric staging, with the added benefit of the wonderfully accomplished Aurora Orchestra under Peter Selwyn, who conducted a thrilling account of the score, Ullmann’s forty-five minute chamber opera came across onstage as the incredible work that it is. Not that The Emperor of Atlantis is easy to programme. As a one act chamber opera it does not fill an evening, but what on earth can be placed alongside it without the risk of bathos? Ullmann wrote the piece in 1943 during his imprisonment in the Theresienstadt (Terezin) concentration camp, to a satirical libretto by fellow inmate Petr Kien, and their original production got as far as the dress rehearsal stage before the camp authorities noticed what was going on and banned the work. But the score was smuggled out, and although Ullmann, Kien and most of the original cast were then deported to Auschwitz to be murdered there in 1944, The Emperor of Atlantis was reconstructed and finally premiered onstage in Amsterdam in 1975. As a work it is a legacy of faith, cultural and spiritual achievement and above all hope that emerges – astonishingly – from the vilest of circumstances and the most appalling conditions known to man. Small wonder that Conway, in his excellent programme notes, admits that the opera’s conclusion makes him weep almost every time he hears it. In his production, Conway has opted to set the work in a stage area that is clearly a camp or prison, reminding us of the circumstances of its creation, with a central desk at which the Emperor works for much of the time, and with a series of hospital screens that are moved around to denote the four main scenes of the original scenario. The look is grey and bleak. High above the set sits the narrator, playing the part of Loudspeaker, and to remind us (as if we need reminding) of where we are, he wields a searchlight that rakes the audience from time to time. The narrative is a simple parable or fable: the Emperor is at war, communicating via telephone and radio with his generals and advisers, and casualties mount on all sides until the figure of Death goes on strike and refuses to allow anyone further to die. A girl shoots a soldier but the bullet has no effect: out of death their duet turns into an allegorical love dance and song. Death then appears at the Emperor’s desk, towering over him – he will resume his normal duties provided the Emperor himself agrees to be the first victim. The Emperor (after singing of his love of life) eventually agrees. His own death clears the way for everyone to start dying again. As mordant, political satire – especially given the circumstances of its creation – the moral of The Emperor of Atlantis is truly extraordinary. To make the evening more substantial – I am not certain that it needed anything more, but let that pass – Conway decided to precede The Emperor of Atlantis with a simply-staged Bach cantata, Christ lag in Todesbanden, BWV 4. The four soloists are ushered onstage into the camp by Death, who gestures with his sickle as they begin their performance in front of two watching figures, the Emperor and his Fool, Harlequin. Gradually the singers converge on a platform centre stage, looking ever more like a group of camp inmates, until they sing Bach’s final chorale. At that, there is a roll of drums and a trumpet motif and Loudspeaker announces the evening’s entertainment: the Emperor of Atlantis in four scenes. 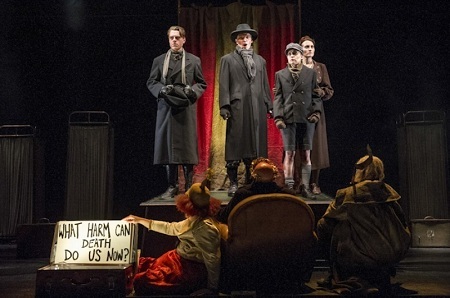 The stage style at this point is Berthold Brecht and the musical style is Kurt Weill: a show is being staged for our benefit, and the artifice is pointed up, rather than ignored. The entertainment begins. I found the overall quality of the singing and playing in The Emperor of Atlantis about as good as anything I have ever heard ETO perform – and the list is long. But what a score they have to perform here! Ullmann’s style is totally melodic, always accessible, with ravishing orchestration that creates beauty out of the horrific fable that his librettist and dramatist has constructed. What is more, even his lushest of melodies avoid sentimentality: this is a hard-nosed allegorical piece of work, and the music is at one with the onstage action. As music theatre it is little short of astonishing. As the Emperor, Richard Mosley-Evans sang with huge distinction, his tone resonant in the ample Snape acoustic but his diction sharp and his performance well controlled. His great aria towards the end as he wrestles with the concepts of life and death was truly outstanding. Callum Thorpe as Loudspeaker got the proceedings off to a lively start, once again with warm and deep baritonal tone, and incisive narration. The two female roles were well contrasted, Paula Sides delivering a beautiful, warm melodic line in her duet with the undead soldier and Katie Bray projecting character and a strong mezzo presence as the Drummer. As Death, Robert Winslade-Anderson proved to have both stage presence and a commanding, resonant bass. And strongly acted supporting performances came from Rupert Charlesworth as the Soldier and Jeff Stewart as Harlequin – the latter injecting both genuine humour and commedia dell’arte resonance into his performance. As an ensemble, there was no weak link. And a foretaste of the sheer quality of the singing and playing had already been provided in the Bach cantata, sung by Bray, Sides, Charlesworth and Thorpe to a hushed, sensitive accompaniment from the Aurora players. Ullmann was a pupil of Schoenberg and (later) a disciple of Berg, but his Emperor of Atlantis score has myriad musical references to other giants in the canon: notably to Mahler, occasionally to Richard Strauss and to more distant figures like Mendelssohn. The Mahlerian Laendler that plays as the soldier dances with the maiden is achingly evocative; so, in a horribly distorted way, is the minor key parody of Deutschland Ueber Alles sung in the very first scene. But the score as a whole is astonishingly rich, and touches of Kurt Weill and the jazz era are suddenly there, to disappear as quickly as they arrive. This is music that one could learn to love very easily indeed. The work ends as Death has resumed his proper role, and the four soloists from the opening Bach cantata once again converge centre stage, by now looking stripped of colour, clothing and emotion: their final chorale, a threnody, indicates all too clearly what their fate is about to be, but affirms the supremacy of spiritual life over physical death. At this point Conway’s juxtaposition of the Bach cantata with the opera made perfect sense and provided a life-affirming, albeit shattering conclusion to the work. But my own view is that it could be equally powerful as a stand-alone, 45 minute piece – after all, as you leave the theatre with echoes of Ullmann’s extraordinary melodic sound world in your head, what else is there really to say? The Emperor of Atlantis plays at Malvern Priory on 14 November and at Buxton Opera on 17 November. Beg, borrow or steal a ticket – it is a fabulous ETO achievement.